Increasing consciousness over automobile safety has driven the installation of airbags across all kinds of vehicles. Concurrently, airbag electronics are becoming an essential commodity in the automotive industry. OEMs are actively adopting smart airbag technology, which is influencing the production of airbag electronics. Control modules are being designed to work effectively with advanced sensors. New developments in the manufacturing of crash sensors, airbag deployment module and collision detectors are also influencing the manufacturing landscape of airbag electronics. Companies such as, Autoliv (Sweden), Key Safety Systems, Inc. (US), Denso Corporation (Japan), Toyoda-Gosei Co., Ltd. (Japan), Takata Corporation (Japan), TRW Automotive Holdings Corp. (US), Hyundai Mobis, Ashimori, Nihon Plast, and Ningbo Joyson Electronic are being observed as the global leaders in airbag electronics manufacturing. Transparency Market Research’s latest study has profiled these companies as the key players in the global airbag electronics market. According to the report, the global airbag electronics market is expected to grow robustly during the forecast period, 2017-2026. Over the forecast period, the global airbag electronics market is poised to expand at a volume CAGR of 6.8%, registering sales of over 237,500 thousand units by the end of 2026. The report has assessed several factors that will impact the growth of the global airbag electronics market during the forecast period. In terms of production, emergence of advanced sensors are expected to influence the development of electronic components for airbag systems. These factors are estimated to influence the production of airbag electronics in the upcoming years. Several market players are expected to witness favors from government initiatives and regulatory policies on making automobile safety more effective and increasing the efficiency of airbag electronics. In 2017, nearly 60,000 thousand units of airbag electronics were installed in mid-sized cars and compact cars across the globe. The report estimates that over the forecast period, mid-sized cars will represent largest share on global airbag electronics market volumes. By the end of 2026, more than one-fourth of global airbag electronics market volumes will be accounted by mid-sized cars. The report further reveals that compact cars will register fastest growth at a volume CAGR of 8% during the forecast period. The report also estimates that aftermarket sales of airbag electronics are expected to gain traction towards the end of the forecast period. Through 2026, OEM will be observed as the largest sales channel for airbag electronics, while aftermarket sales are estimated to register a 7.3% CAGR in terms of volume. By the end of 2026, Europe will register highest sales of airbag electronics. 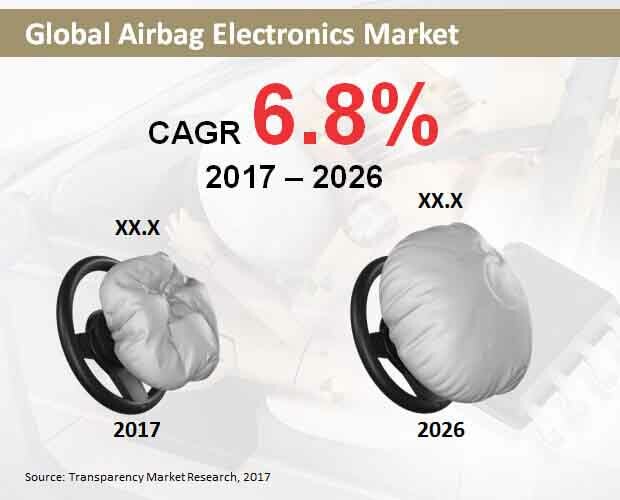 Increasing emphasis on automobile safety, consolidated presence of automakers in countries like Germany and the UK, and rising adoption of smart airbag technology, are collectively expected to factor the growth of Europe’s airbag electronics market in the near future. By the end of 2026, Europe will register sales of over 74,100 thousand units of airbag electronics, becoming the largest market for airbag electronics in the world.